FOR Mervyn Davies there really is nothing like the joy one derives for collecting birds. The octogenarian has been a regular at the Warwick Pig and Calf Sale for decades. "I started breeding them when I left school, when I was about 14-years-old and now I'm 83-years-old," he said. "It was just a hobby but I had everything once, I had scrub turkeys, king parrots, ducks, geese and guinea fowl. I had the works." 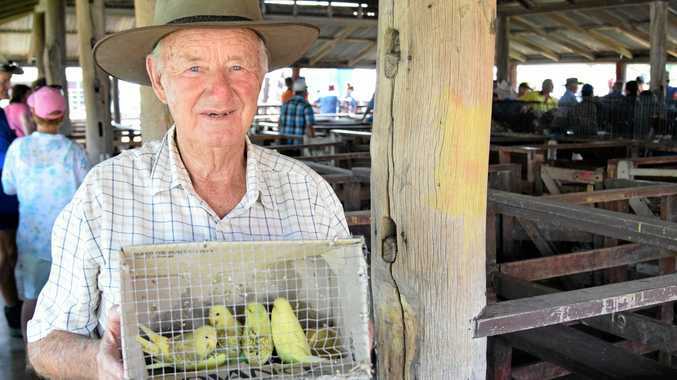 "Now I only have budgies, peach-faces finches and cockatiels," he said. Mr Davies sells his birds to avid collectors and on local trading websites. It's good source of income for the family, so much so Mr Davies formed a partnership with his son and a friend, Tony Hansfield. "If I haven't got birds my son has them and he doesn't have them, then Tony does." Selecting a bird is far from an exact science but Mr Davies know what is good when he's looking at it. "I look for good colour and healthy birds." For young people want to get a start in the hobby Mr Davies said the best place to look is the Pig and Calf Sale. "It's a great place to get quality birds, and anything else," Mr Davies said.